Shortly after the Republican debate in Orlando, when Rick Perry was being pummeled for his mangled answers on Pakistan, Mitt Romney's flip-flopping, and more, I happened to find myself talking to a Texas Democrat who has known Perry since his first days in the state legislature. I asked if she was surprised at how things had gone for Perry in the debates so far. Yes, she said. She was surprised he was doing as well as he was. Perry's lack of aptitude for the debate stage has been common knowledge for years in Texas. Why else would he push to hold a debate for his 1998 race for lieutenant governor on a Friday night in El Paso, when everyone was watching high school football, in a time zone different than most of the state? But here's what I don't get. We've been through this before, and I don't really understand why one Texas governor's poor debate performances are being judged so much more fatal and disqualifying than another's. We seem to be forgetting just how bad Perry's predecessor was at this. 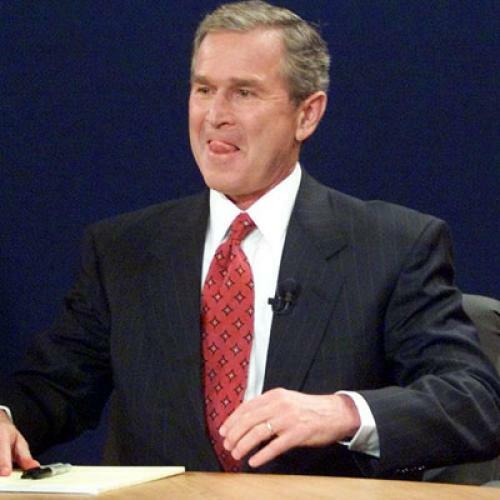 Some quotes from a December 1999 article on George W. Bush's first few debate performances: "To many, Bush came across in the debates as uncertain, propped up by rehearsed responses and a series of stilted talking points...'He gets the deer-in-the-headlight look that Quayle used to get,' said Fred Davis, a GOP media strategist and former Quayle advisor... 'You almost see his brain trying to remember what he was told, and Quayle came across that way.'... 'We've seen two performances where he is not meeting the expectations that the political community has for him as their leader who was going to take them to the promised land,' said one Republican strategist close to the Bush campaign...'Each debate you hope the candidate gets a little better,' said a GOP consultant.... 'If Bush doesn't improve, it could be a real disaster.'" Yet the establishment stuck with Bush and after his scare in the New Hampshire primary, he easily put John McCain away. Here are three theories I can muster for why Perry's lousy debates seem to be taking more of a toll. I'd be curious what others think about this. 1. The world's a scarier place and people have higher standards. By many measures, American politics have deteriorated badly in the past decade. But it is possible that 9/11, the financial meltdown and the stalled recovery have left voters, and pundits, with less tolerance for amateurish responses. When Bush couldn't come up with the name of Pervez Musharraf in 1999, it was considered an unfair gotcha question; when Perry stumbles in his debate answer about Pakistan, it's considered grievous. When Bush was asked who his favorite political philosopher was in a 1999 debate, he blurted out "Jesus Christ." When Perry was asked by an Iowa voter last week what he's been reading, he answered Friedrich Hayek -- but this failed to satisfy the questioner, who said later that he was "disappointed by the answer and by the fact that he had mentioned only one book." 2. Perry's performances are objectively worse. This one's up to the viewer to judge. By one standard, Perry outperforms Bush on stage -- he is far less likely to stumble into hilarious malapropisms and syntactical dead-ends and roundabouts. But arguably Bush's confused responses at least suggested some sort of intellectual machinery wheezing away, albeit clunkily, a churn that seems absent in Perry's vacuous responses. 3. Perry is the victim of class snobbery. Bush and his loyalists shrugged off his shaky debates with the cockiness of the prep-school slacker shrugging off a bad grade. He was the Andover, Yale and Harvard biz school kid who skated by on gentlemen C's with the assurance that he'd do fine in life anyway. Whereas even within Texas, Perry has labored far more against the image of the country bumpkin who is a few posts short of a full fence, the boy from Paint Creek who graduated 10th in a high school class of 13 and had to switch to animal science after failing out of veterinary school. If you ask me, the class factor plays a big role in the double standard, and we all ought to be asking ourselves more why we were so willing to cut the Texan from Kennebunkport and New Haven so much more slack. Or are we all just subconsciously atoning for letting Bush get away with it then? If so, tough luck for Perry.